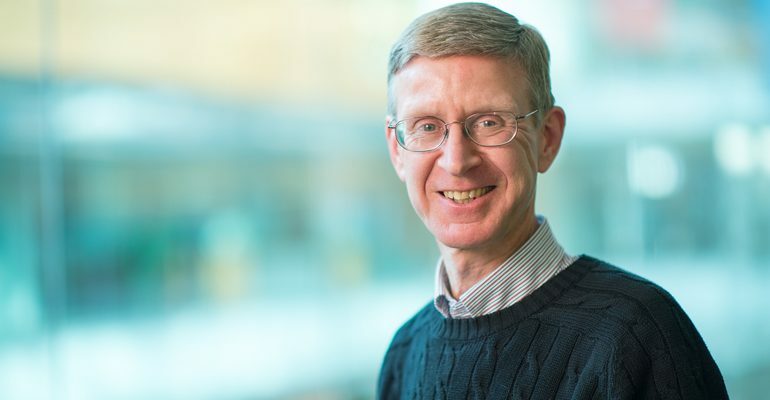 Paul Ahlquist, leader of the Morgridge Institute virology team, is one of four recipients of the Hilldale Award for distinguished contributions to teaching, research and service. This year, the four recipients will be recognized at a meeting of the Faculty Senate on April 4 and will receive a cash prize of $7,500. Paul Ahlquist was nominated by two separate departments on campus: oncology/McArdle Laboratory for Cancer Research in the School of Medicine and Public Health, and plant pathology in the College of Agricultural and Life Sciences, as well as the Institute for Molecular Virology. In his nomination letter, Ahlquist is referred to as a campus “crown jewel” and one of the UW’s “most-prized faculty members,” and it mentions his “superb and longstanding research record, his leadership skills, his tireless efforts in promoting science and training future scientists.” Over the past two decades, many students in their evaluations have called Ahlquist “the best” teacher they ever had at the UW. In addition to his research into RNA viruses, HIV, papillomavirus and others, Ahlquist is a graduate student advisor in four programs, leads the UW Carbone Cancer Center Human Cancer Virology Program, serves on multiple faculty mentoring committees, teaches a popular undergraduate-graduate course in virology, and is a leader among the UW–Madison Virology Minority Summer Research Program.